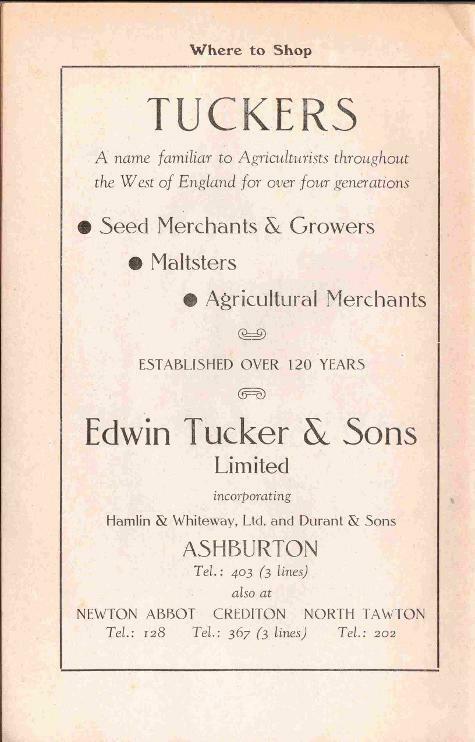 At least two Tucker families have featured in Ashburton - the family of solicitors in the town (see immediately below) and the family of Edwin Tucker and Sons, seed merchants, who came to Ashburton in the early 1860s*. The latter firm is still going strong today (2016). Some information is at the bottom of the page. *1831 According to their own website - perhaps an earlier relative ? From: Background to the tombstone survey - see the sub-menu of Churches and memorials. **Robert Coard Tucker 1833 - 1925. There was in fact a third Robert - Robert Edward Tucker, born September 1863. he also became a solicitor. *** 1838 - 1935 Son of Robert Tucker Snr. For a picture of a cannon, for some years at the top of East Street, presented by Gen Sir Charles Tucker in 1904, see the Conflict sub-menu of Ashburton in Peril. Above: Memorial to Lieutenant General Sir Charles Tucker GCB GCVO in Ashburton Churchyard. Above: Portrait of Sir Charles Tucker. Official War Office Photograph. Pre-1955, in the public domain. At the Grammar School annual prize day in 1931, a letter was read out from General Sir Charles Tucker, aged 94, the oldest surviving old boy of the school at the time. He had joined the 22nd Regiment in 1855, paying £450 to become an Ensign. His pay at the time was 5s 3d a day. He retired in 1905 after 50 years in the army, but was still a full Colonel in the South Staffordshire Regiment. His connection to the army therefore totalled 76 years. At 95, Sir Charles was the oldest general in the British Army. When he died in 1935, the family asked that there be no flowers at the funeral except Haig poppies. The funeral had to be postponed several times, because rough weather delayed the return of his body from Biarritz. The coffin was carried from the Hall, where Sir Charles had been born, on a gun carriage drawn by four horses: it was draped with the Union Jack, and his plumed hat, belt and sword were on top. All the pall-bearers were high-ranking army officers. A band from the South Staffordshires played Chopin's Funeral March and Handel's Dead March in Saul, as the funeral processed to the parish church through streets lined with people. The family mourners were: Mr Duncan Tucker, son. Mr and Mrs H Ward Oliver, son-in-law and daughter. Mrs R L Bazalgette, granddaughter, and Capt R L Bazalgette*. Col. R E Tucker, nephew, and Mrs R E Tucker. Mr N P Squarely, nephew. Mrs O Fosbrooke, grand-niece, and Mr O Fosbrooke. A firing party of fourteen fired a salute as the coffin was lowered into the grave, followed by sixteen buglers sounding The Last Post and Reveille. *Reginald Louis Bazalgette had married Leonie Frederica Ward Oliver, the daughter of Henry Ward Oliver and Edith Augusta B Tucker. His obituary in the Western Morning News said that he had taken part in campaigns in Bhotan (1865) and Perak (1876) and had fought against Sekukuni and the Zulus. "Old Stephen Tucker (husband of Joanna Squarry) of Teignmouth, great grandfather to Robert Tucker, of Ashburton. William Tucker, his son, was a Newfoundland merchant. Andrew Griffin Coard, bap. Sep. 1778, and William were William's two sons, who lived with their grandfather, Stephen, whilst their father was on his voyages. William became a sailor, was taken prisoner by the French...He afterwards sailed from Newfoundland, and the ship was never heard of." Stephen Tucker wed Johannah Squeery, 1734. 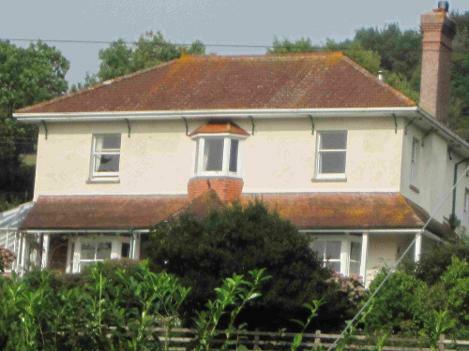 1739 West Teignmouth. William, the son of Stephen and Joanne Tucker. Lloyd's Register 1791. Vessel: Two Brothers, Captains Townsend and Prowse. Voyage Dartmouth to Newfoundland, 67 tons/8 men. Built at New England 1770, for W. Tucker. William Tucker Jr. of West Teignmouth, with Andrew Griffin Coard Tucker of Ashburton, Gent owned the Brig 'Jane & Mary', 86 Ton. Built in France in 1788, it was 'a Prize'. Andrew Griffin Coardy Tucker was baptised 4th September 1778 at West Teignmouth, the son of William and Elizabeth. In 1794 Andrew G C Tucker was registered as an apprentice attorney to Thomas Turner, in Exeter. He married Maria Pitts Squarey in August 1799 at West Teignmouth. His second marriage was to Harriet Luke in November 1823 in Plymouth. Amongst the marriage bonds and allegations held at the Devon Heritage Centre is one for Andrew Griffin Coard Tucker, Doctor of Law, widower, and Harriet Luke of St Andrew, spinster. Dr Andrew G C Tucker wrote 'Ornithologia Danmoniensis or an history of the habits and economy of Devonshire Birds', published by Cadell and Davies, London, 1809 - the first person to publish a work on the birds of just one county. Maria Pitts Tucker was buried at Ashburton on 17th May, 1821. 8 September 1828 Robert Tucker of Ashburton married Lavinia Hancock of Wiveliscombe. She was the youngest daughter of Wm Hancock, a banker. = Lavinia Mary, baptised 1832, the daughter of Robert Tucker and Lavinia ? 8 February 1833 A son born to 'the lady of' Robert Tucker. = Charles Tucker - see memorial above. 14 August 1841 Henry, youngest son of Mr R Tucker, solicitor, died. 23 October 1841 Lavinia Tucker, aged 32. Wife of Robert Tucker, mother of four children, died. 1849 The Western Times alleged that Mssrs. Matheson, Tucker and Caunter were as strong in Ashburton as Matheson and Co were in China. 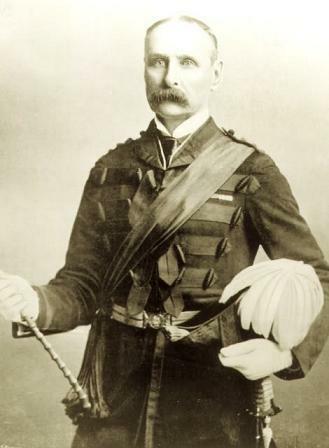 For more on Lieut General Thomas Matheson, MP for Ashburton, see the Election fever sub-menu under Gathering together. For more on the Caunter family, see the sub-menu under People and properties. * Robert Charles Tucker, born March quarter 1860. see Deaths below. 5 March 1860 Robert Charles, infant son of R C Tucker, solicitor, died. The Ashburton Rifle Corps assembled in April, with Lieut R C Tucker, and Sergeants Eddy, Philips, Hern, Harding, and Amery. In the 1861 census widower Robert Tucker, aged 58, solicitor, is living in East Street with his family. They include his 28 year old son Robert C(oard) Tucker, another solicitor, and his wife Catherine M Tucker. Also in the household are Robert Snr's unmarried daughter Anne,24, and his granddaughter Catherine W Tucker. Robert Edward Tucker was born in the September quarter 1863, Newton Abbot district. The deeds of The Wilderness, East Street, include an indenture made on November 9th, 1863. In 1866 a committee in Totnes was investigating bribery in elections. Robert Harris gave astonishing evidence as to the scale of the problem, claiming that £25 was almost the going rate for securing votes, with larger amounts being paid at times. He said that Mr Tucker of Ashburton was frequently at Totnes - 'He does the legal dirty work'. Alan P(lasket) Tucker was registered in the December quarter of 1866, in the Newton Abbot district. In White's Directory of 1878-79 Robert Tucker and Robert Coard Tucker are described as Tucker and Son, solicitors at The Hall. The Hall, at the top of East Street, is described by Nicholas Pevsner as being built in 1803. It had (has?) a polygonal entrance hall, with a bust of Mr. Tucker by P. Olivieri. The staircase had alternate fluted and twisted balusters. 27 April 1892 Captain R E Tucker married Annie Lloyd Williams in Anglesey. 2 May 1893 When Robert Tucker died, aged 90, he was described as a 'sturdy' Liberal and a good friend to the poor, the 'Grand old man of the town'. Relatives named at the funeral included his sons Major R C Tucker and W Tucker, and his daughter Mrs Squarly. This would be Alan Robert L Tucker, born the September quarter 1894 Newton Abbot district. April 19th 1898, the Rev C C Tucker, son of Mr Tucker of Ashburton, married Charlotte Smith, at Ely. In 1902 R E Tucker was Captain and Hon Major of the Ashburton 5th (Haytor ) Volunteers Battalion, Devonshire Regiment A Company. The company were based in Station Road and were 107 strong. Kelly's Directory of Devonshire 1902, p 31. July 1907 Maj and Mrs Tucker. Married 29th July 1857. Major Tucker's father was Robert Tucker, and his father was Andrew Tucker, Doctor of Laws. Mrs Tucker's father was the Rev. W. Kitson. They celebrated their diamond anniversary ten years later. Right: A clock to celebrate the golden wedding of Robert Coard Tucker and Katherine Margaret Kitson. 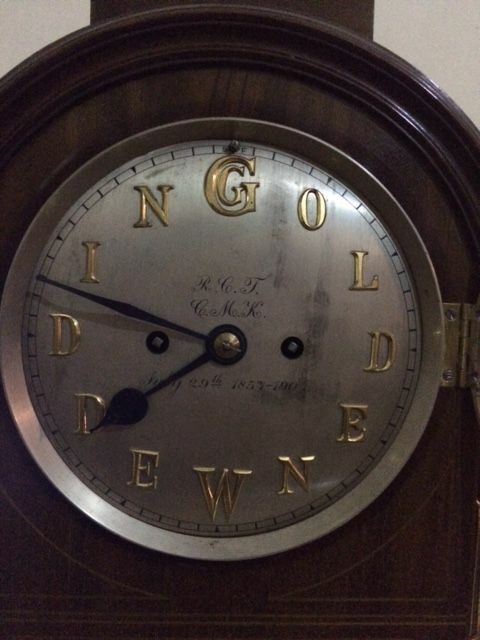 The words 'Golden Wedding' replace the numbers; the initials of the coupleand the date of their wedding is written on the face of the clock. Many thanks to Brendan Tucker for this photograph - see more in the Virtual museum. In the 1911 census 78 year old Robert Coard Tucker is living at The Hall with his wife Catherine Margaret Tucker and his daughters Katherine Winifred and Marion Tucker. He describes himself as a retired civil servant on a pension. 1914 Second Lieutenant Alan Robert Lloyd Tucker, Royal Warwickshire Regiment, died between 18 and 20 December 1914, aged 20. He was the son of Robert Edward and Annie Lloyd Tucker, of The Hall, Ashburton, Devon. October 1925, 'in his 93rd year' Major Robert Coard Tucker, solicitor, died. 17 August 1867 Dorchester. Edward A Worthy, son of Charles Worthy, married Annie Tucker, youngest daughter of Robert Tucker. 13* December 1836, aged 29. The sister** of Robert Tucker, solicitor. Edwin, the son of John and Sarah Tucker, was baptised in Harberton in March 1839. The family lived at Hazard, and Edwin's father was a yeoman. The 1861 census for Hazard, in Harberton, shows 22 year old Edwin Tucker, farmer and seed dealer, living with his widowed mother Sarah. By 1871 he is living in Kingsbridge Lane, Ashburton, and is married to Elizabeth Jane. They have four children. He married Elizabeth Jane Parnell in 1862 - they begin having children in Ashburton in 1863 (see below), one of whom is J Parnell Tucker*; his wife is Elizabeth J on the 1891 census. He is a seedsman (in brackets), maltster and farmer. In 1869 Mary Hext and her son John were charged with stealing 14 turnips and 75 tops, belonging to Edwin Tucker. They were each fined 5s 6d to cover the value of the produce, plus 7s costs. This was probably Alfred Henry Tucker, born September quarter 1872 in the Newton Abbot registration district. 5 July 1899 Alfred Henry Tucker married Elizabeth Ella Spreckley at Loughborough. He is described as the third son of Edwin Tucker. In 1901 John Parnell Tucker is living at Orley House, East Street. In the 1911 census Edwin Tucker Snr, maltster, seed merchant and farmer is living at Thorn Park with his daughter Emily Tucker and his son Edmund. In the same census J Parnell Tucker, maltster and seed merchant, is living at Welstor. In 1911 Henry Hainworth and William Hainworth* sold 'Stables, gardens and premises' in East Street to Edwin Tucker the younger for £465. The property now known as the Wilderness was then built there. From the deeds to the Wilderness.Thanks to Sandy Smith for showing these to me. 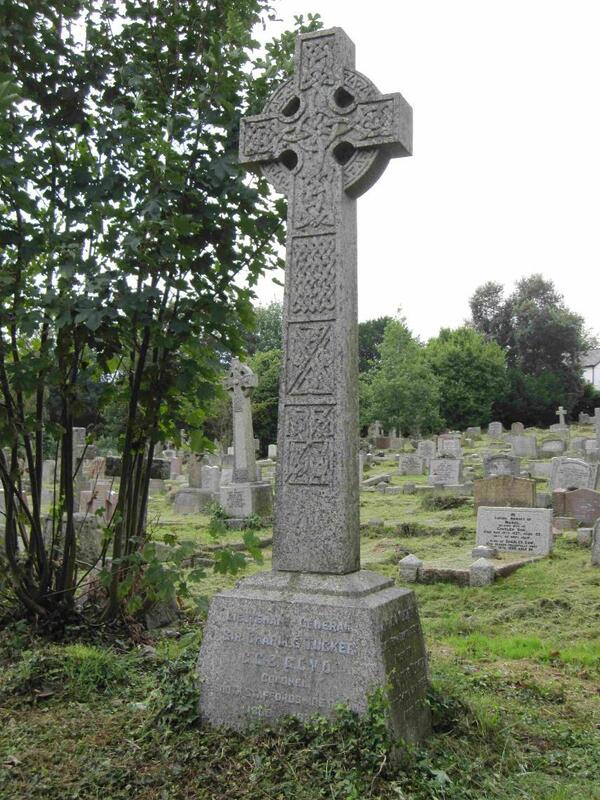 *Father and son, executors for Catherine Ann Abraham, the previous owner (and sister of Henry Hainworth) who had died 8th April 1910. 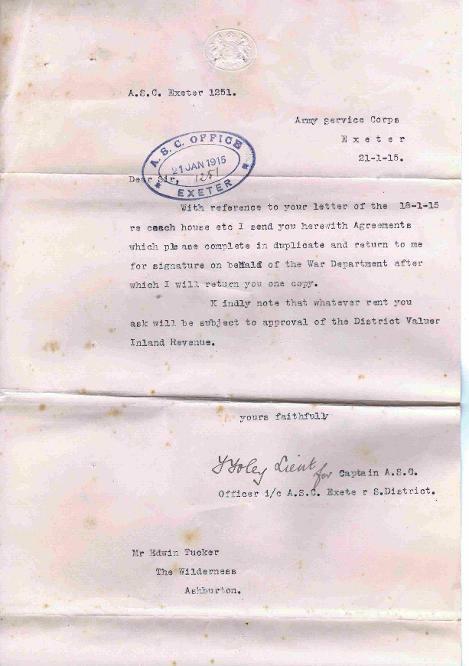 With reference to your letter of the 18-1-15 re coach house etc I send you herewith Agreements which please complete in duplicate and return to me for signature on behalf of the War Department after which I will return you one copy. Kindly note that whatever rent you ask will be subject to approval of the District Valuer Inland Revenue. T Yoley (?) Lieut for Captain A S C Officer i/c A S C Exeter S District. I have to thank you for your letter of the 21st inst & herewith enclose the two forms duly filled in with respect to the letting of my stables & coach houses for the use of the soldiers about to be billeted at Ashburton. You will observe I have named the sum of 25/- per week as rent. Of course I do not know the rate of pay but do not think I am asking beyond value. I might point out that my premises are now being occupied, a quantity of stores having been placed in them some days since. The funeral of Edwin Tucker of Thorne Park took place on Saturday 2nd September 1916. The mourners included his sons: J Parnell Tucker, Edwin Tucker, A H Tucker and E Tucker; and his brother from Hazard, A Tucker. 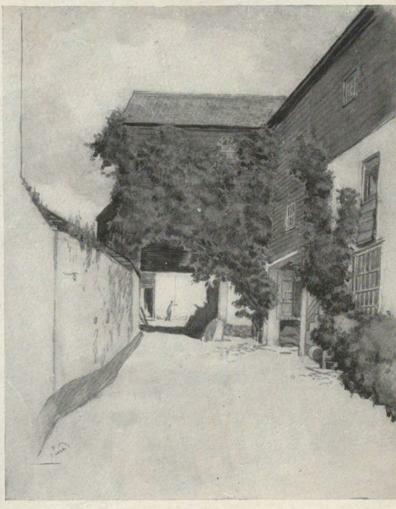 From the Official Guide of Ashburton, 1940s to 50s.